Toronto native Rob Tardik is since two decades an in-demand guitarist of the Canadian music scene. He started his solo career with the self-produced album Without Words (2006), which garnered rave reviews of Internet critics and radiomen. Now Rob returns with his sophomore album The Right Time (2009) presenting new compositions and three highlights of his previous album. Guest musicians on this album are Davor Jordanovski (piano, keyboards and Hammond), Curtis Freeman ( bass guitar), Jess Salem (drums and percussion), Carson Freeman (saxes, flute), and Mike Petkovski on piano on That’s a Strut. Cruisin' brings you right into good mood. A bit syncopation is irritating the flow, but Rob showcases with his swaying solo that he is the announced master of guitar. Frame Of Mind features Davor Jordanovski's elegant piano style and Carson Freeman's enduring sax introducing Rob's supreme lead guitar. More of this easy going stuff presents Flip Flop. Rob's precise and clean guitar loops expose his impressive talent. But his discreet performance on The Right Time illustrates his feeling for subtle tones and moods. Rob opens with Smoothy the window of melodic harmony wide. The vibrant Bounce is a good fundament for uplifting moves. When Rob plays melodic songs like Flow, I wish he would play on an Ibanez instead on the a bit tinny sounding Godin Multiac Acoustic/Electric, but perhaps is that his personal style. Sax player Carson Freeman's skills shine on You Know What I Mean. Rob takes the lead on guitar but gives his fellow-musicians always enough space to expand. When mild winds caress your skin and you are sitting on the right place, then you just feel good. What can be a better addition than Summer Nights? On That's A Strut one can really hear, that the band enjoyed their performance. What a relaxed elegance. The Bossa Nova infected Virtue let you swing, while the contemplative Waiting For Rain gives you time for recreation and reflection. After my personal taste the best piece of the album. This is certainly the way Rob should go further. 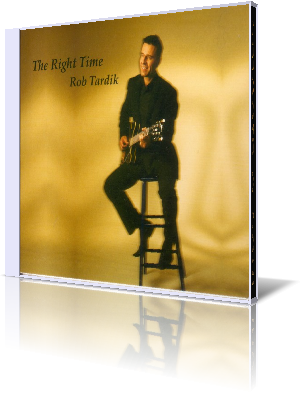 Rob Tardik's second album The Right Time is a break through the wall of uniformity. With his own inexhaustible power Rob Tardik will walk the path to success.